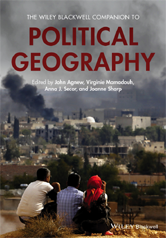 The first Companion to Political Geography was a landmark statement about the nature of the sub-discipline that also set the research agenda for political geography. The Companion brings together the best researchers and communicators in the field, who highlight provocative theoretical and conceptual debates, and present a compendium of key worldly and intellectual developments. Tied between two poles: A specific notion or a buzzword? A crisis of citizenship or new frontiers of the political? The classic debate: “When” and “what” is the nation? New approaches: “How” and “where” is the nation? What is a movement, or who moves what how? Conclusions: A BRICS challenge to the established global order? What does it mean to be “more-than-representational”?